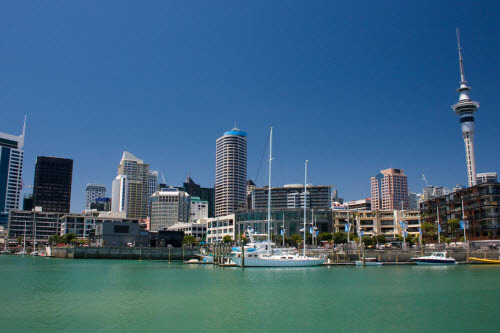 Discover cheap holiday packages to Auckland from Wellington, Christchurch, Queenstown and more. Auckland is New Zealand's largest city. This bustling metropolis boasts beautiful urban beaches, exciting island day trips and a food and music scene that will captivate all your senses. Planning a holiday not too far away from home? Browse Webjet’s exclusive holiday deals that include affordable flights to Auckland and hotel stays for the duration of your trip. Don't spend hours comparing prices online. Let us do all the hard work, so all you need to do is turn up and enjoy your holiday. Auckland is the gateway to New Zealand's winterless north. The capital city is known for its warm almost tropical summers and milder winters. While some are quick to dismiss the city as "just another business district", it has more to offer Kiwi travellers than meets the eye. It's natural assets alone make it a dream destination. Frugal backpackers and big spenders will all be able to find something to do. Whether it's going for a hike to one of the nearby dormant volcanoes or taking a super-yacht for a spin around Waiheke Island. Domestic flights are more affordable than ever. With great deals on direct domestic routes, you'll have more than enough left over to splurge on big-ticket items. One of the best things about exploring your own country is the exchange rate. You don't need to worry about how much that cup of coffee will cost in NZD. Food from Chinese, Japanese and Korean restaurants costs only NZD 10, and you can pick up something at fast food establishments for as little as NZD 8. Travelling to Auckland also means you have more flexibility with what activities you can do and where you stay. With local trips usually being short, you can afford to spend more money on a hotel room or a bucket list experience. 1. Weather: The best time to visit Auckland is in May or September. You'll beat the summer crowds, save on airfare and still enjoy pleasant temperatures. But if you don't mind contending with other visitors, you'll have warmer weather and less rain during the peak season of November to March. 2. Getting Around: Get the AT HOP Card. you'll save up to 20% on single fares, and the card only costs NZD 10. It's perfect for traveller's who prefer using public transportation or don't want to hire a car. 3. Accommodation: Auckland is a popular holiday destination and rooms fill up fast. Make sure you book well in advance or take advantage of a packaged deal to avoid disappointment. 4. Wi-Fi: Free Wi-Fi is available in specific public spaces. You can use the service for free for 30 minutes per day, per device. Once you've reached that limit, you can buy a bundle to continue using the internet. 5. Free Avocadoes: Plan your trip between November and March for the Otuataua Stonefields free avo picking. There is a limit of five per person, but it's worth it. 6. Safety: In the summer, Auckland's black sand beaches can reach scorching temperatures. If you're visiting during this time, make sure to wear shoes that can handle the heat for walks on the volcanic grains.